Introduction: Differently-abled children face unique challenges to receive routine dental care. Aim: To assess the barriers to dental care in differently-abled children and also to assess their oral hygiene status and caries experience. Materials and Methods: A cross-sectional study was designed to collect information from 331 differently-abled children aged 6–14 years attending four special schools and 21 integrated schools in Kochi. The children were grouped into intellectually impaired (II), visually impaired, hearing impaired, and orthopedically handicapped. The information regarding access to care was collected from the parents/caretakers using a pretested structured questionnaire. A special recording form was used to collect clinical data on Dentition status and Oral Hygiene Index Simplified. The data was cleaned, coded, and analyzed for descriptive and inferential statistics using SPSS software version 22. 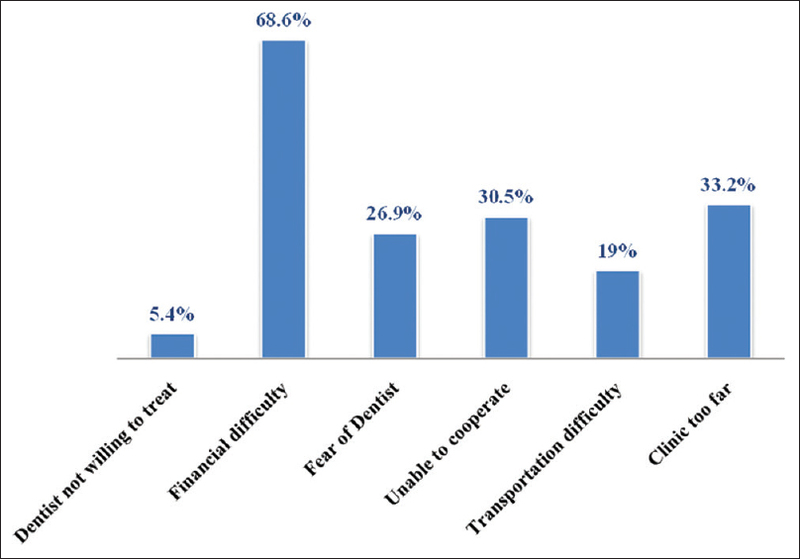 Results: The significant barrier to dental care was financial difficulty (68.6%); more among II (39%). The mean decayed, missing, and filled teeth (DMFT) value was found to be higher among the children with orthopedically handicapped (1.62 ± 2.7) than others. A higher mean dmft value was found among the II (2.81 ± 3.4) than others. Oral hygiene status of most of the differently-abled children was found to be good. Conclusion: Limited access to dental care among differently-abled children was found out. Health care structure in India is overburdened by increasing population. In India, 2.21% of the population, approximately 26.8 million people have a form of disability. In the age group of 5–19 years, around 6.6 million (24.5%) children are differently abled. The number of children with disabilities is increasing, but little attention is paid to their health care. Dental care is found to be the most common unmet health care need for the differently-abled children. Their oral health may be neglected because of focus on their disabling condition, other major diseases, or limited access to oral health care. Moreover, dental care is sought only on an emergency basis. A relationship between unmet need for dental care and unmet need for medical care has also been established. Differently-abled children are at a greater risk of poorer oral health due to more frequent oral infections and periodontal disease, moderate to severe malocclusion, and craniofacial birth defects. A significantly higher level of periodontal diseases and dental caries was found in differently-abled children than their healthy counterparts. Provision of dental care for them is challenging due to problems in accessibility to dental health services. Penchansky and Thomas (1981) have described five “access” problems denoting difficulties of health services namely, availability of services, accessibility of services, affordability of services, acceptability of services, and accommodation of services. The difficulty to access for dental health care are explained by their physical condition, lack of trained dentists to treat them, lack of awareness among parents or caretakers, and low socioeconomic status. Newer dimensions of access to dental care include factors internal to the patients such as perceived need for care, cultural preferences, and language. Although many of the barriers to dental care may not seem amenable to intervention, numerous researchers have reported that access to one type of care may contribute to health-seeking behavior and access to other types of care. Little evidence is available about the access of oral health care among differently-abled children in India. Extensive studies have been reported in other countries.,, The prevalence of dental diseases among this group has been reported, but the access problems were not identified.,, This study was conducted to assess the barriers to dental care among the differently-abled children and the normal children attending the special and integrated schools in Kochi. The findings would provide evidence for making policies for improving access to dental care services for differently-abled children. To assess the oral hygiene status and caries experience in these children. A cross-sectional, descriptive study was conducted between January 2014 and March 2014. Ethical approval was obtained from Research Ethical Review board on August 12, 2013. The study was done in special schools and integrated schools in Kochi, a major port city in Kerala, in South West India. The special schools enroll children based on the type of disability. There were around 40 such schools in Kochi, of which two for intellectually impaired (II), one for hearing impaired (HI) and one for visually impaired were selected. Only private schools were taken into consideration since government special schools were nonexistent in Kochi. Integrated schools enroll children with various types of disability in addition to nonimpaired (NI) children. Both the government and the private integrated schools were included. Orthopedically handicapped (OH) children were selected from the integrated schools only. Sixteen private integrated schools and seven government integrated schools were selected for the study. The study population consisted of 6–14 years old school children attending special and integrated schools in Kochi. The children were divided into four groups based on the type of disability: II, visually impaired, HI, and OH. NI children with a comparable age group from the integrated schools were also included. A pilot study was conducted in comparable age groups to see the feasibility of the study and to deduce the sample size. A convenience sampling method was used as the study is generating a hypothesis. In the first stage, information about the schools was obtained from District Educational Department and Block resource center. The selected schools were invited to participate in the study. Six schools rejected to participate due to noncooperation from the parents and inconvenient timing for the study. In the second stage, children were selected from each school based on the following inclusion criteria. Children having written informed consent. Thirty children from each special school with a particular disability were selected. From the integrated schools, 30 children representing each of the disability were selected from the government and private schools. Thirty NI children each from private and government integrated schools were selected making a total of 390 children. In a school, if the required number of subjects is <30, then additional schools were selected to cover the sample size. A total of 331 children who satisfied the inclusion criteria were selected to participate in the study. Barriers to dental care were assessed using a pretested structured questionnaire administered to the parents or caretakers. The questionnaire was adapted from similar study conducted in Saudi Arabia, and content and face validity was carried out to adopt Indian scenario. The children were examined at the classrooms, seated comfortably on an ordinary chair, under artificial light. Clinical data were collected on Dentition status and treatment need and Oral Hygiene Index-Simplified. SPSS software 11.5 Chicago IBM was used for statistical analysis. The data were cleaned, coded, and analyzed for descriptive statistics. Univariate analysis such as frequency, percentages, mean and standard deviation of the variables was calculated. Bivariate analysis such as Chi-square test was calculated to assess the association between categorical variables. The level of significance was set at P ≤ 0.05. Almost 86.7% of the children were differently abled. 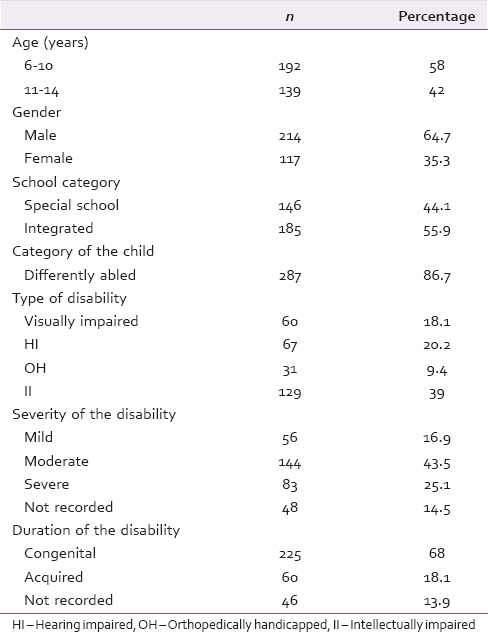 Children with intellectual impairment were 39% compared to visual impairment and hearing impairment. Males were 64.7%. Special and integrated schools covered almost equal number of children [Table 1]. 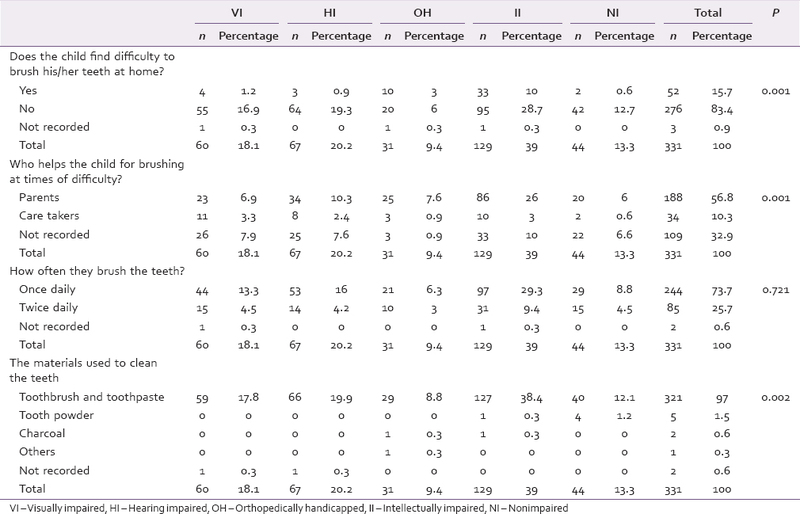 [Table 2] shows that 28.7% of the children with intellectual disability had no difficulty to brush their teeth. In times of difficulty, 26% of them depend on their parents. Around 29.3% of the children with intellectual impairment brush their teeth only once. Among them, 38.4% use toothpaste and toothbrush to clean their teeth. Tooth powder has been used to clean the teeth by 0.3% of the II and 1.2% of the NI. About 0.3% of the children with intellectual impairment and OH use charcoal to brush their teeth whereas no one else in the other categories uses. The time of child's last visit to dentist is described in [Table 3]. It shows that 34.4% of the parents or caretakers were unaware of the time of child's last visit to dentist. Almost 33.2% of them report that the child's last visit to dentist was more than a year. Only 1.2% of them report the child's last visit within 1 week. [Table 4] shows that 46.1% of children in total require one surface filling and 33.1% require extractions. Preventive treatment is needed for 29% of the children. Only 15.8% of the children need pulp care and restoration. Almost 28% of the children with visual impairment require preventive treatments, for others it is less. Around 12.6% of the children with intellectual impairment require extraction which is double than for hearing and visually impaired (6.3%) and 3 times more among OH (3.2%). Barriers to dental care are described in [Figure 1]. One of the significant barriers to dental care noted in our study was high cost of dental treatment (68.6%). The parents reported that almost 94.6% of the dentists were willing to treat their children. Around 26.9% of the children were afraid of dentist. Almost 30.5% children find difficulty to cooperate with the dental treatments. Transportation difficulty was faced by 19% of the children. The parents of 33.2% of the children reported that the dental facility is far from home. Around 14.5% of the parents and caretakers reported that they have no time to take care of the child's dental needs. 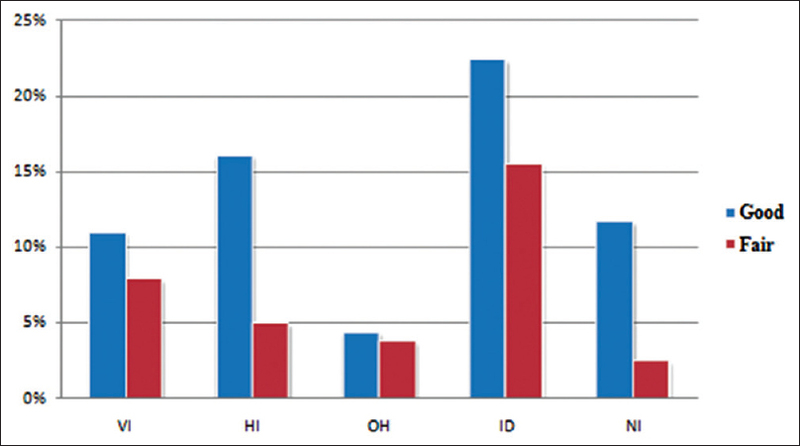 [Figure 2] shows that the intellectually impaired children faces more financial difficulty for dental care than others. Oral hygiene status of most of the differently-abled children was found to be good [Figure 3]. The mean decayed, missing, and filled teeth (DMFT) value was found to be higher among the children with orthopedically handicap than others [Figure 4]. A higher mean dmft value was found among the II than others [Figure 5]. The mean DMFT and dmft values were found to be lower among the children with visual impairment than others. Data about the prevailing oral health needs and the barriers to dental care will be required for designing a system of care for children with disabilities. In our study, access to dental care among the differently-abled children attending special schools and integrated schools were assessed. Studies of children with disabilities observed that maintaining an adequate level of oral hygiene is difficult to achieve for them. Brown and Schodel reviewed 32 studies of disabled children and reported that such patients tend to have poor oral hygiene than their non disabled counterparts. Jain et al. reported that oral health status of mentally-retarded population was poor. In contrary, a better oral hygiene was observed among the hearing and visually impaired than other children with disabilities by Rao et al. Similar findings were observed in our study where the oral hygiene status of most of the differently-abled children was found to be good [Figure 3]. This contradictory finding in our study may be due to the adequate oral care given by the parents/caretakers. It was noted that majority of the children in our study depend on their parents/caretakers for oral hygiene measures in times of difficulty. Ivancic Jokic et al. reported a higher mean DMFT among the children with disabilities (6.39) than healthy children (4.76). Avasthi et al. found the mean DMFT in the blind to be 2.4 while that in the deaf/mute to be 3.18. Purohit and Singh found out that dental caries was present in 89.8% children from special schools as compared with 58.6% of the control group. They noted a mean DMFT values for special school children and healthy controls as 2.52 ± 2.61 and 0.61 ± 1.12, respectively. A comparable mean DMFT value was obtained in our study. The mean DMFT value was found to be higher among the children with orthopedically handicap than others [Figure 4]. A higher mean dmft value was found among the II [Figure 5]. The mean DMFT and deft dmft values were found to be lower among the children with visual impairment than others. A study by Lewis et al. observed that 78% of children with special health care need were in need for dental care. In the same study, those who reported a dental care need, 10.4% did not receive any of the required dental care. A previous study by de Jongh et al. noted that children with disabilities generally receive less restorative care than their nondisabled counterparts and that nearly 80% of children with disabilities have untreated caries. Our study showed that 46.1% of the children require one surface filling, 9.1% require two surfaces filling, and 15.8% require pulp care and restoration. 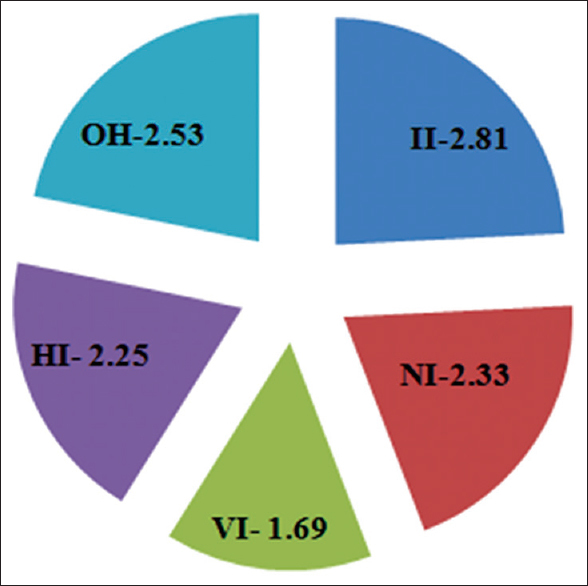 The need for preventive treatment was marked among the children in our study (29%) [Table 4]. The majority of children in the present study have limited access to dental care. In our study, the utilization of the dental services were limited by differently-abled children as discussed earlier and access to oral care and special services to them are very minimal. This finding is consistent with a study reported by Al-Shehri, where 46% of the children with disability had difficulty in seeking dental care and 55% of those with disabilities had unmet dental needs. One of the significant barriers to dental care noted in our study was high cost of dental treatment (68.6%). Studies done by Rapalo et al. and Schultz et al. pointed out that high cost is a potential barrier in seeking dental care among children with disabilities., The Department for International Development (2000) highlights how disability can exacerbate poverty because it can lead to isolation and economic strain for the whole family. In our study, the parents reported that most of the dentists are willing to treat the children with disabilities (94.6%). Even though the dental profession wants to serve this group, lack of training to treat them becomes a major barrier for delivery of dental services. AL-Shehri observed that fear of dentist was one of the difficulties to obtain dental care. In our study, 26.9% of the children were afraid of dentist. Most of the children were able to cooperate with the dental treatments. Transportation difficulty was faced by 19% of the children. Though the public transport facilities are available in India, they are not disabled friendly. However, the caretakers somehow manage to take them for dental treatments. Almost 33.2% of the parents reported that the dental facility is far from home. This may be the reason for their reluctance to seek dental care. Only 14.5% of the parents and caretakers reported that they have no time to take care of the child's dental needs. Majority of the parents/caretakers reported that the child's last visit was more than a year (33.2%). This result shows that the differently-abled children seek dental care only in case of emergency. Almost the same proportion of the parents/caretakers was unaware of the time of last visit (34.4%). This finding reveals lack of perceived dental care among them. Oral hygiene status of most the differently-abled children were found to be good. The mean DMFT value was found to be higher among the children with orthopedically handicap than others (1.62 ± 2.7). A higher mean dmft value was found among the II (2.81 ± 3.4). Unmet need for preventive (29%) and restorative (71%) treatments was observed. The significant barrier to dental care was financial difficulty (68.6%). Limited access to dental care among the children with disabilities was observed. Infrasrtuctre Statistics; 2010. Available from: http://www.mospi.nic.in/mospi_new/upload/disablity_india_statistical_profile_17mar11.htm. [Last cited on 2015 Aug 02]. Lewis C, Robertson AS, Phelps S. Unmet dental care needs among children with special health care needs: Implications for the medical home. Pediatrics 2005;116:e426-31. Guay AH. Access to dental care: Solving the problem for underserved populations. J Am Dent Assoc 2004;135:1599-605. Purohit BM, Singh A. 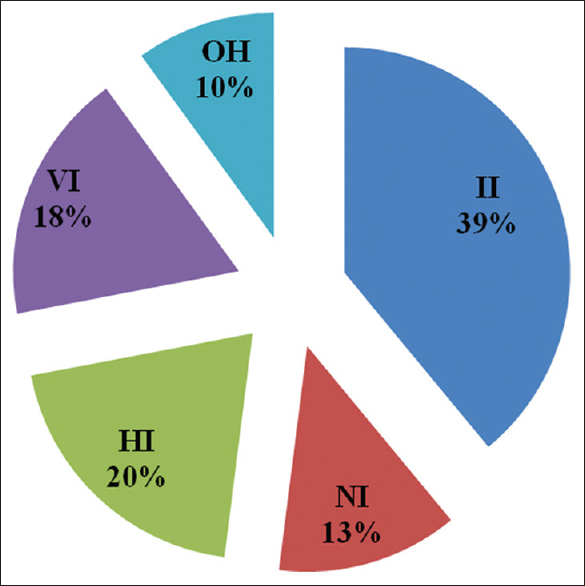 Oral health status of 12-year-old children with disabilities and controls in Southern India. WHO South-East Asia J Public Health 2012;1:330-8. Owens J, Misty K, Dyer TA. Access to dental services for people with learning disabilities: Quality care? J Disabil Oral Health 2011;12:17-27. Al-Shehri SA. Access to dental care for persons with disabilities in Saudi Arabia (Caregivers' perspective). J Disabil Oral Health 2012;13:51-61. Koneru A, Sigal MJ. Access to Dental Care for Persons with developmental disabilities in Ontario. J Can Dent Assoc 2009;75:121. Jain M, Bharadwaj SP, Kaira LS. Oral health status and Treatment Need Among Institutionalised Hearing-Impaired and Blind Children and Young Adults in Udaipur, India. A Comparative Study. Oral Health Dent Manag 2013;12:41-9. Rao D, Hegde A, Munshi VK. 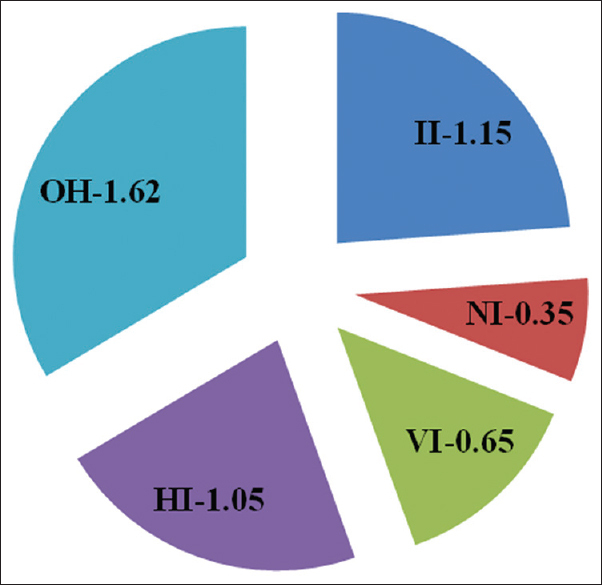 Oral hygiene status of disabled children and adolescents attending special schools of South Canara, India. Hong Kong Dent J 2005;2:107-13. Avasthi K, Bansal K, Mittal M. Oral health status of sensory impaired children in Delhi and Gurgaon. Int J Dent Clin 2011;3:21-3. Brown JP, Schodel DR. A review of controlled surveys of dental disease in handicapped persons. ASDC J Dent Child 1976;43:313-20. Ivancic Jokic N, Majstorovic M, Bakarcic D, Katalinic A, Szirovicza L. Dental caries in disabled children. Coll Antropol 2007;31:321-4.
de Jongh A, van Houtem C, van der Schoof M, Resida G, Broers D. Oral health status, treatment needs, and obstacles to dental care among noninstitutionalized children with severe mental disabilities in The Netherlands. Spec Care Dent 2008;28:111-5. Rapalo DM, Davis JL, Burtner P, Bouldin ED. Cost as a barrier to dental care among people with disabilities: A report from the Florida behavioral risk factor surveillance system. Spec Care Dentist 2010;30:133-9. Schulz ST, Shenkin JD, Horowitz AM. Parental perceptions of unmet dental need and cost barriers to care for developmentally disabled children. Paediatr Dent 2001;23:321-5.